Simon & Schuster Books for Young Readers, 9781481430623, 448pp. Five high school seniors. Two different roads. One life-changing decision. For fans of Tommy Wallach and Patrick Ness comes a “must-have coming-of-age story” (School Library Journal) that explores what happens to five teens when they choose the road…and the road not taken. Teddy Steinkellner is the author of Trash Can Days: A Middle School Saga and its sequel, Trash Can Nights: The Saga Continues. He lives in Stanford, California. 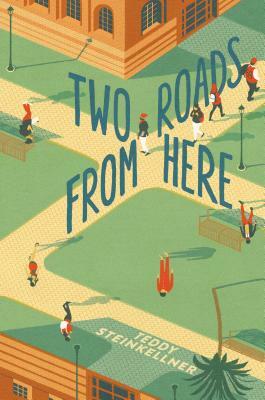 Two Roads From Here is his first novel for young adults. Visit him at TeddySteinkellner.com. "Destiny or decision? The answer may be unknowable, but Steinkellner gives readers something to think about." "Those who enjoyed Susan Beth Pfeffer’s Life as We Knew It or Emery Lord’s When We Collided will be captivated by this title’s alternating character views and dramatic plotlines. A must-have coming-of-age story that will resonate with all types of YA readers." "The book is compulsively readable and unfailingly well written, and the characters are nicely individualized. Impressively original." "[Steinkellner] delivers an impactful plot encouraging readers to think seriously about how their choices affect themselves and others. Readers will be able to easily relate to the struggles of these high school seniors as they make life-defining choices."